Welcome to 1520 Flicker! 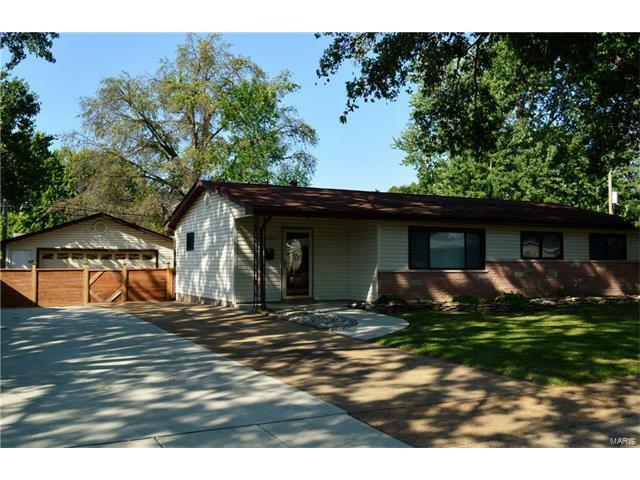 One level living in this 3BR/1BA/2-Car Garage ranch with nearly 1300 SF! Attractive Brick/Stone & Vinyl home with private back yard & detached 2-car garage. AWESOME, rustic cedar fencing adds to curb appeal! Beautiful leaded glass entry door**Huge Family Room w/big picture window & 2" blinds, laminate flooring, 4" baseboards with corner trim**Roomy Kitchen/Breakfast Room with wainscoting and chairrail trim. **Updated lighting throughout**New flooring in laundry/storage area**Master BR has laminate flooring and ceiling fan**Bedrooms 2 & 3 have new carpeting & updated ceiling fans**Nicely updated bath w/tile surround, adult-height vanity & cabinetry. Privacy fence, patio and garage provide lots of fun space out back. Wait until you see how deep this double driveway is--you can park many cars here! Within a short distance to Schnucks, Roberto's restaurant and more! Enjoy City of Florissant amenities. Passed Florissant Inspection! Fast close available! Mullanphy to Loveland to Street.